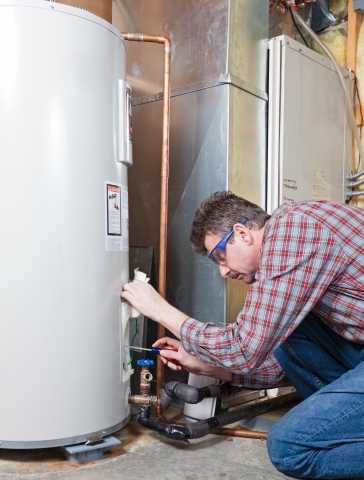 If your water heater has been leaking, smelling funny, or one of these common issues, it may be time for a new system. Depending on the type, water quality, and if you’re keeping up with regular maintenance, a water heater will last between eight and 12 years. If your system is reaching the end of its life, it may be time to start looking for a new one. Ace Hi Plumbing, serving the communities of Fort Collins, Loveland, and Estes Park, provides expert service and our professional technicians will be able to offer suggestions and guidance on which type of water heater is right for you and your family. Contact our team today and we’ll schedule an appointment. Conventional: The more common type of water heater is one with a tank, or reservoir that holds hot water. The tank typically holds between 30 and 80 gallons and can be run on either natural gas, propane, oil, or electricity — whichever is used in your home currently. Conventional heaters store hot water 24/7, whether you’re using it or not. These systems generally cost between $500 and $900. Electric Heat Pump: This type takes heat from the air and uses it to help heat the water in the tank. These systems work better in hotter climates where there is a more consistent source of heat. Solar: As you can imagine, these systems use solar power to heat the water, making it a cost-efficient option, after the installation of solar panels. Tankless: This option is becoming more and more popular as you’re not paying to store hot water. Tankless water heaters only heat water when you need it, or on demand. The downside is that they can only provide around two to five gallons per minute, so if you’re running the dishwasher, the water pressure in the shower won’t be very good. These systems will run you around $1,500 to $3,000. Fuel Type: The fuel type you choose to use for your water heater will affect the cost, size, and efficiency. Size: This will come down to the size of your family and how many water-using appliances will be used at the same time. Efficiency: If you are concerned about energy and water costs, be sure to ask about the efficiency of a unit before you purchase. Costs: Don’t just consider the cost of the unit itself, but the monthly and annual costs of water and energy as well as the labor costs of having it installed. Compare several models to determine the best option. The water heater installation cost will vary depending on which type of unit you choose and where it is being installed in your home. If you have any questions about which water heater is right for you, call Ace Hi Plumbing and we’ll be happy to help you out. If you’re ready to schedule an installation appointment, contact us today!